further the development, and to promote progress of all anatomical or biomorphological sciences. encourage and increase scientific, technological, educational and administrative exchanges among anatomists worldwide. provide general guidelines for educational, technological and scientific purposes and for issues of general interest to anatomical sciences. coordinate and support the preparation, revision and publication of documents on the terminology of the anatomical sciences and biomorphology. stimulate friendship and cooperation among members of associations of anatomists. promote international scientific congresses, symposia and other meetings of anatomical and morphological sciences. To accomplish these aims, the IFAA has an Executive Committee with Officers that serve for a 4/5 year period (between IFAA Anatomical Congresses) and whose actions are overseen by representatives of the constituent member societies and who assemble at the Congresses as the IFAA General Assembly. It is the General Assembly that represents the universality of the members of the IFAA and its decisions are binding. The election of the place and date of the IFAA Anatomical Congresses is also made by the General Assembly. 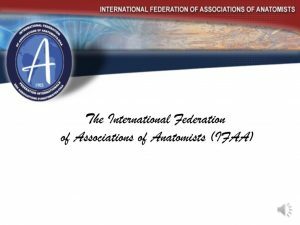 The members of the IFAA are all Associations/Societies of Anatomists, national or multinational, that are elected to join by the General Assembly and who pay IFAA dues. To help inform anatomists throughout the world of the activities of the IFAA, a newsletter (Plexus) is regularly produced and placed on our website. To provide understanding of the issues being dealt with by the IFAA, in addition to the minutes of the Executive Committee placed on the website, you are referred to the President’s address and to the “Kyoto Declaration” (both of which are also on this website).